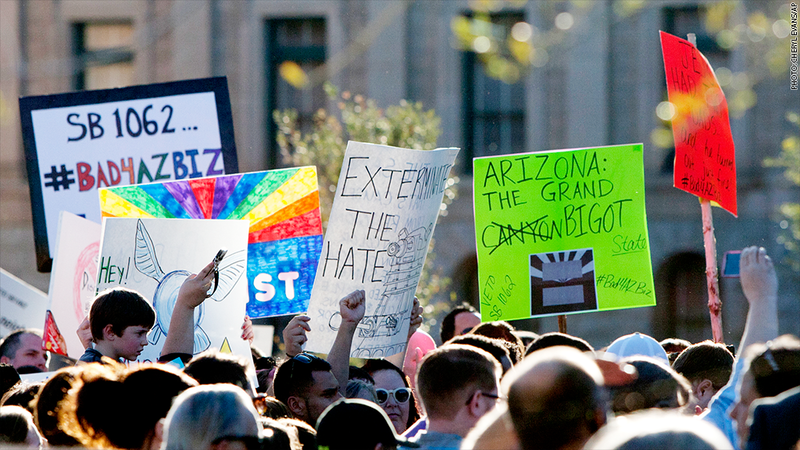 After business owners lashed out, Arizona's governor vetoed a bill that would have allowed retailers to refuse service to lesbian, gay, bisexual and transgender customers based on the owners' religious convictions. "I have not heard one example in Arizona where a business owner's religious liberty has been violated," Gov. Jan Brewer said in her Wednesday evening announcement. The bill drew controversy since it passed the Arizona legislature last Thursday. 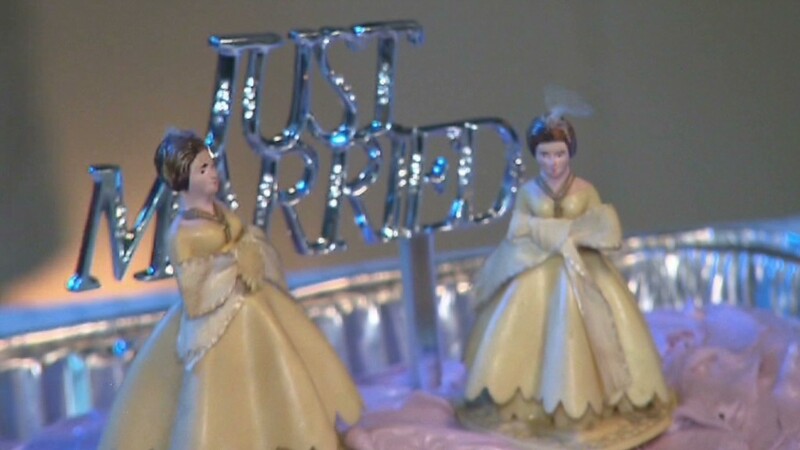 While proponents say the legislation was introduced as a way to afford religious freedom to business owners, critics say it opened the door to discrimination. "When the legislature passes bills like this, it creates a reputation that Arizona is judgmental and unwelcoming," states a letter that more than 80 businesses sent to Gov. Brewer on Monday. "This will haunt our business community for decades to come." National corporations including American Airlines (AAL), AT&T (ATT ), Delta Airlines (DAL), Intel (INTC), Marriott (MAR), PetSmart (PETM), Starwood (HOT) and Yelp (YELP) were among those urging Brewer to veto the bill, saying the law would be bad for the state's reputation and bad for business -- repelling tourists, potential employees and current workers who live in the state. "I can assure you that this proposed legislation is causing tremendous concerns for our employees, particularly those who live and work in Arizona," American Airlines CEO Doug Parker wrote in a letter to Brewer. Meanwhile, Intel, which has nearly 12,000 employees in Arizona, said the bill directly conflicted with its own non-discrimination policy, which "values and welcomes diversity in the workplace." A local Tucson pizza shop, Rocco's Little Chicago Pizzeria, received national attention for opposing the bill by putting up a sign saying it reserves the right to refuse service to Arizona legislators. Business development groups feared that new companies will no longer want to relocate to the state -- dealing a huge blow to an economy that is only just beginning to recover from the recession. Barry Broome, president & CEO of the Greater Phoenix Economic Council, said in a letter to Gov. Brewer prior to her veto that four companies that were considering expanding to Arizona threatened to cancel their plans unless she issued a veto. Even Apple (AAPL), which recently announced plans to build a new glass plant in Mesa, Ariz., and bring 2,000 new jobs to the state, reportedly called on Brewer to veto the bill. The Hispanic National Bar Association announced it would no longer hold its annual convention in Phoenix this September because of the bill. "As a national association of lawyers committed to promoting the ideals of equal protection, equal opportunity, tolerance, and inclusiveness, it is imperative that we speak up and take immediate action in the presence of injustice," HNBA president Miguel Alexander Pozo said in a statement. After the veto, it wasn't immediately clear where the convention would be held. In a nod to the concerns, Brewer said the bill "has the potential to create more problems than it purports to solve." There were also questions about whether next year's Super Bowl would still take place in Arizona if the bill was enacted, with the event expected to be a big boon to the economy. The Arizona Super Bowl Host Committee said it did not support the legislation. "We share the NFL's core values which embrace tolerance, diversity, inclusiveness and prohibit discrimination," the committee said in a statement. "We have heard loud and clear from our various stakeholders that adoption of this legislation would not only run contrary to that goal but deal a significant blow to the state's economic growth potential." Major League Baseball also spoke out against the measure.